Hot Topic, Inc. is the destination for music and pop culture. We have three brands (Hot Topic, BoxLunch, Her Universe) and over 790 stores collectively across the US and Canada. What started as an idea in a Pasadena, CA garage is now 29 years of embracing loud music, diversity, and inclusiveness for people passionate about music, pop culture, and movies. We’re based in the greater Los Angeles, CA area (City of Industry, to be exact) and have 425+ employees at our Corporate HQ. Our total employee population fluctuates, by season, but averages at over 10K company-wide. Our initiative was to redesign the HQ onboarding experience with the intent to increase ramp-up speed and engagement, which ultimately impacts productivity and tenure. There was a glaring need for the onboarding experience to match the brand and culture. We operate in an empowering, autonomous environment, and are very inclusive, which resonates extremely well with employees. The onboarding experience that existed was the complete opposite. It was disjointed, solely focused on new hire paperwork, and did not provide the context or tools for new employees to ramp up quickly, which impacted engagement and productivity. It set the wrong tone and led to some obvious (and confirmed by surveys) disengagement. We also thought heavily about CLV (Customer Lifetime Value) and how we can apply that same metric to people. If we can focus on engaging and ramping up our employees more effectively, we can possibly extend the productivity value and longevity/tenure of our people. The more productive and engaged our people are, the stronger the connection to positive revenue impact. We surveyed all of our new hires from the past six months (80 total) and analyzed the results, while also comparing that with our own views of the onboarding experience. We embrace loud music at our stores and have TV’s and music throughout our office. Our onboarding experience had ZERO music or videos. There were no visuals, no presentation deck, nothing. It set the wrong tone and created an unwanted emphasis on what was lacking vs. what’s ahead as employees start their journey with Hot Topic. As we reflected on all this, we realized there was an opportunity to enhance the employee experience while also assessing impact to productivity - which correlates to revenue. To enhance this experience, we wanted to ensure that it was strategic in connecting new employees to our mission and culture, while also creating an experience that would be both impactful and scalable. We took inspiration from two sources: 2016 Dreamforce and the Hero’s Journey (pop culture inspired thought process that every hero has to go through a journey to become a hero, and that every step in the process helps develop the tools/skills needed to become a hero). At Dreamforce 2016 the theme was “Trailblazer”. As we walked to the main expo floor, a map was handed out with a gamified edge to navigating every booth. For every booth/demo you visited, you received a sticker on your map. When all the locations were complete, you took your completed map to the swag booth and had your choice of Salesforce swag. On average, there was a 20-minute wait in the swag line! By adding the gamified edge to the experience it drove engagement and conversion. 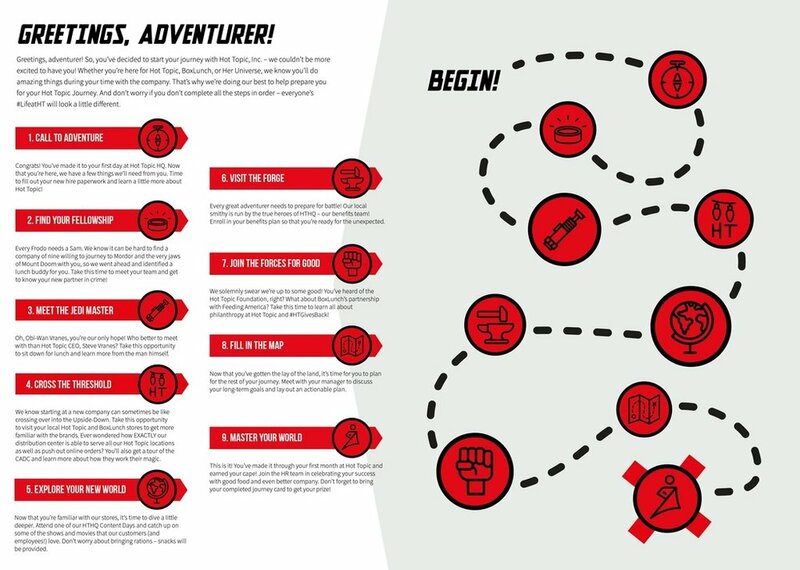 We took the idea of a low tech, gamified map/journey, along with the Hero’s Journey and came up with The Hot Topic Journey - our new hire’s roadmap to becoming a Hot Topic Hero (high performing employee). And since we’re the destination for all things pop culture, we put a fun spin on it. Ultimately, we wanted to answer questions before they were asked and establish new hires in our culture of autonomy, ownership, and collaboration. The nine steps in the journey aimed to do just that. We built a roadmap guiding employees through their first 30 days. This included key touch points designed to connect them to our culture, embed them into our business through engagement and context, drive ramp up speed, and productivity (key to revenue impact). Our team collaboratively discussed how we can map this out and create a great experience. More than just a positive experience, we wanted to make sure it impacted ramp up speed and connection to our mission and road map. We thought it would be great to have a map to guide new hires through what is always an anxious experience. Looking at the Dreamforce map as inspiration, we started talking about how each job is a journey you take with a company and the idea of the Hero’s Journey surfaced. It was perfectly aligned with our product and culture. The idea behind the Hero’s Journey is that every hero starts in the ordinary world, and has a set of experiences that help shape the individual into a hero. This was the perfect mindset for onboarding. Everyone who starts fresh at a company is in the same boat - we wanted to provide the right steps to turn everyone into a Hero at Hot Topic. We asked, “how we can do that most effectively?” “What’s important from a tactical and strategic perspective?” “What posed as roadblocks to effective onboarding and assimilation into our business?” These answers shaped how we designed the program. We landed on a name relatively quickly: The Hot Topic Journey. 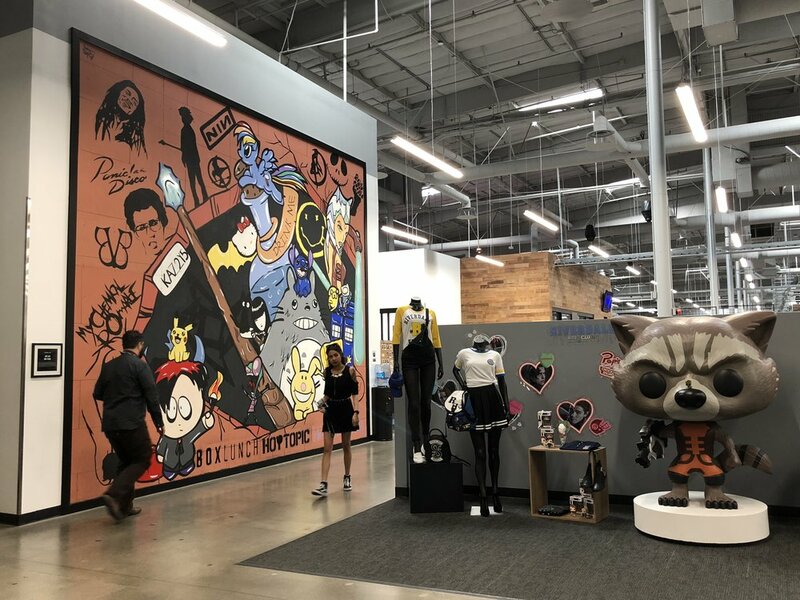 It’s a taken from the Hero’s Journey and speaks to the adventure every employee will experience at Hot Topic. We took all these questions and laid them out on the table. Our initial list started with five steps. It then grew to nine as we continued to ask questions evaluate feedback. There are a few steps that required cross-functional partnership from benefits, HR, and Ops so we collaborated with them to build out the experience and ensured we had full buy-in. Once we had an idea of what we wanted the steps to be, we started building out the experience tied to each step. That included the presentation deck, content, copy/voice and design assets. Our in-house marketing team was swamped as it was the busiest time of year for them, so we hired a freelance graphic designer. We created the copy, provided creative direction and also found a local printer to produce high-quality bi-fold maps. We wanted a way to mark off each step so we also had small stickers printed. To help complete the experience, we had large decals of each logo printed so we can cling them to the conference room doors to help new hires identify meeting rooms. Once we had all the content and assets in place, we set up time to review with our CEO and SVP of Marketing. We absolutely needed their sign off and received it enthusiastically. 50% decrease in new hire attrition (leaving within 1 year): In 2016, we had relatively high turnover at our corporate office for employees with one year or less tenure. That number dropped by 50% after a full year of running the Hot Topic Journey. Internal NPS: Prior to the Hot Topic Journey, our internal Net Promoter Score amongst new hires was 38%. Post Hot Topic Journey, our score increase to 68%. Increase in qualified referrals: There was a strong correlation between NPS score and increase in qualified referrals. We saw a 22% uptick in qualified referrals over a 12-month span, and a 35% increase YoY in referrals hired. We wanted to measure and project Employee Lifetime Value. Against our control group, we saw a significant improvement in engagement and self-performance review after launching the Hot Topic Journey. Note, these numbers are a projection - we need another 2-3 years to assess quantitatively the overall ELTV impact. What the below highlights is a strong enough correlation between on-boarding, increased engagement & sentiment, which ultimately leads to less attrition and higher performance. When we launched The Hot Topic Journey, there was immediate positive results for those that completed the Journey. What we didn’t anticipate is how it would make other employees feel. Those that recently joined the company prior to launching the Journey missed out, and they felt excluded. This was a big miss - we didn’t want employees feeling less valued. We provided swag to those that were hired in the preceding 3 months, and actually used this as a catalyst to incorporate The Hot Topic Journey branding and voice into more events outside of onboarding. We also didn’t anticipate how much time it would take to manage the nine steps. We initially scheduled the steps as we made hires, and realized quickly the varying timelines would cause us to be facilitating multiple events every week. We streamlined the events so that we had no more than 1-2 steps on any given week, which was much more manageable. Lastly - we gathered a lot of feedback, and what was loudest was the need for systems training. When we designed the program, we wanted to solve for the biggest challenges in ramping up in a new role and we missed this basic need. Since the goal of our onboarding program is accelerated ramp-up to productivity, we added more training to our Visit the Forge session to include technology and core systems training. It’s important to convey the immense value and competitive advantage your employees represent. Employees aren’t commodities; they’re your life blood, and the difference between success and failure. Onboarding represents the start of the employee life cycle and can change the trajectory of your employees from the start. Just a small upward tilt to that trajectory, and you’ll reap significantly increased ROI across your employee’s tenure. You can’t afford to NOT invest in onboarding. This was our message to our Executive Team, and it’s a hard one to ignore. Much like recruiting, onboarding is a team sport. You need full buy-in from the top down to ensure a successful program. Innovation doesn’t always mean you’re the first to do it. Sometimes innovation is iteration. Don’t be afraid to draw inspiration from the most unlikely sources and use it to create something new. Don’t be afraid to adapt it as your business evolves. This mindset, fueled by two completely separate inspiration points, led to what was the #2 focus of our company for 2017. We had a very low tech approach. We paid $500 to create the creative assets, $200 to have it printed (we printed bifold maps on cardstock and had branded dot stickers printed as well). The other investment was our time and effort to execute the roadmap for new hires. We built out a seven question survey in Google Forms to capture feedback that measured engagement, sentiment, and an overall self-performance rating. We might move to a different platform for collecting feedback, and add more pulse surveys throughout the various steps of the Journey. We'll continue to iterate and improve as we collect more feedback, but what we started out with was more than enough to validate the investment we made in enhancing our onboarding.